NICOLE RICHIE NEWS: House of Harlow on the Daily 10! House of Harlow on the Daily 10! Former Dancing with the Stars pro Lacey Schwimmer was spotted on the E! 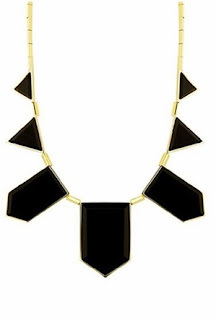 's daily 10 show wearing a necklace from Nicole Richie's House of Harlow collection. Lacey was wearing the House of Harlow 1960 Gold and Black Resin Necklace. The House of Harlow resin necklace is one of the most popular pieces from the collection as it has been seen on Kim Kardashian, Kristen Cavallari, Amerie, Jessica Alba, Lindsay Lohan, Kumi Koda, Kourtney Kardashian, Katie Cassidy, Vanessa Minnillo and Nicole Richie herself! Kimora Lee Simmons was wearing it on her show as well. I actually have the photo of Kimora Lee Simmons wearing the necklace too.